Once you get below the quasi-human flesh, this is the true form of the Terminator 2 protagonist. 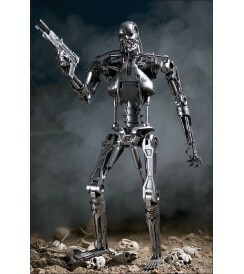 This is the endoskeleton of the T-800 cyborg sent back in time by the resistance to protect John Connor -- the future leader of the human revolution -- from a dangerous new shape-shifting cyborg. 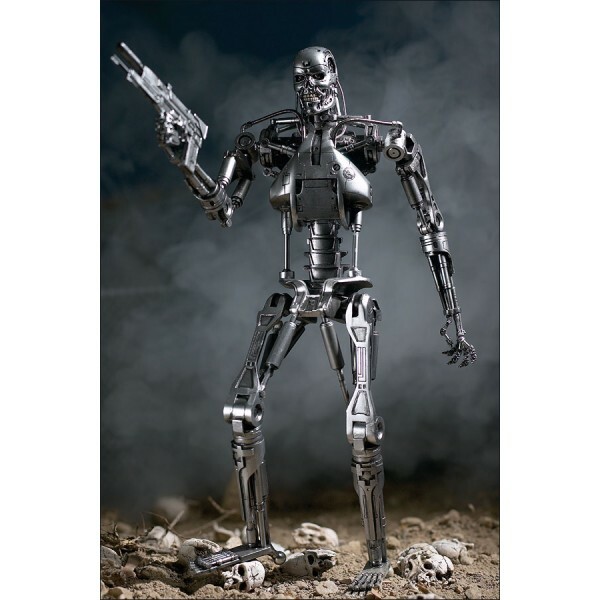 Though normally covered with human-like flesh, the endoskeleton is what lives beneath the skin. Height: 7 1/8 inches. Articulation: Neck (360 degree motion), shoulders (ball joints), upper arms, elbows (piston activated), forearms, chest (piston activated), waist, hips (piston activated), knees, shins. Total of 17 points of articulation. Accessories: Handheld machine pistol with silencer, pile of skulls, custom poster stand.